This is a small section of the mural that covers the block long, western wall of The William Way Community Center for the LGBT community in Philadelphia. 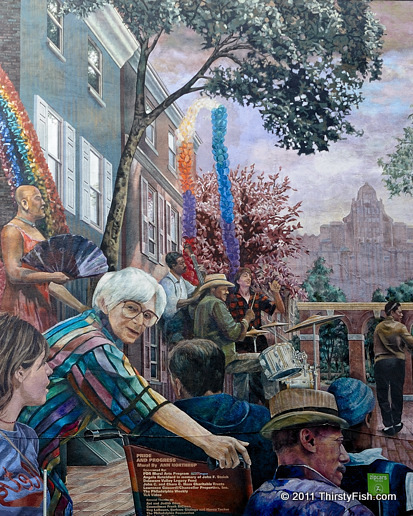 The mural depicts a gay pride street festival with references to the 1960's gay civil rights marches in Philadelphia. The figure of the older lady wearing eyeglass and staring at the observer is the focal point of the mural. The first notable mainstream movie to take on the subjects of AIDS and discrimination based on sexual orientation, was the 1993 picture "Philadelphia" starring Tom Hanks and Denzel Washington. Although the movie was criticized by some in the LGBT community for its flaws, and by many as being too Hollywood, it is still a good watch with a great soundtrack.